One thing that is obvious to most pageant women is that in order to win your pageant, you have to truly be a star. When you meet a star, you’ll know it, but it’s hard to explain what it really means to be a star. It’s also evident when it’s not there – when something is missing even if you can’t quite put your finger on what exactly is missing. The Miss Universe pageant was this past weekend and what an incredible pageant that is! Every single one of the 86 women from around the world is a celebrity. They are stunningly beautiful models. They have bright smiles, graceful walks, and incredible hair. But, not all of them are stars. In an interview after the pageant, one judge was asked why a certain contestant (who seemingly had the whole package) didn’t make it into the finals. The judge simply said that something was missing. The host asked what was missing. The judge said, well I don’t know, but something just wasn’t there. That something, I believe, is the star quality. Everyone has the potential to exude this star quality. Today, we’re going to unpack exactly what this star quality looks like through the analogy of a real star in the galaxy. Then, I’m going to explain how being a star gets you to the top. Finally, I’m going to break down how you can exude that star quality to get to the top! First, let me compare for you a star in outer space with a woman who is a true pageant start. For the sake of this analogy, let’s use a star from far off in our galaxy. – A star in the galaxy is a bright beam of natural burning gas that radiates light that can be seen from a far distance. A pageant star is someone who radiates light from a far distance. It can be seen from miles away. She simply walks into a room and brightens it up. People notice her. – A star in the galaxy is always there, shining brightly not matter who is looking because someone is always looking. The best time to see it is when your side of the world is covered in darkness and when the sun is gone. When the sun comes up for you, the other part of the world is in darkness and that star is shining there for those people. In the pageant world, presence is vital. A pageant star is a woman who is ready to say yes to travel wherever she is needed most. From early morning hours to late nights, the pageant star has to be ready to serve the world around her. – A star in the galaxy burns from natural energy and doesn’t turn off until they die. Pageant stars are the same! These women are the type that have a natural fuel keeping them passionate, serving, and forward-moving. A true pageant star needs this natural fuel otherwise she’d be exhausted trying to fake it. A true pageant star is a woman who’s light shines brightly, not from her own power, but a natural source within her, and is able to be seen even in the darkest situation. So, to recap, Stars do 3 things: it can be seen from a far distance, it is always there, it is fueled by a natural energy. Think of a lamp. No one turns on a lamp and then puts it under a basket. They light the lamp and put it on a table so it will light the whole house. The Bible points this out in Matthew 5:15, right after it says that YOU are the light of the world. Did you hear that? You. Sitting where you are right now at your computer, at the gym, in your home, in your car You, my dear, ARE the light of the world. God wants you to shine! Why? Because, He knows that if you are shining, people will put you up on a freakin’ table, girl! Haha! No one will hide you in a basket. THIS is why people elevate star quality. They can’t help but put the lamp on the table to light the whole house. I promise you this: If you let your light shine, you will be placed on top. You are designed to be the head and not the tail. Above and not beneath. God said You are the light of the world. Let it shine, sister! How? You ask. Simple: Shine light. Light is basically everything that is positive: Whatever is true, noble, whatever is right, pure, lovely, admirable if anything is excellent or praiseworthy think about such things (Philippians 4:8). Do not let negative, fear-based, anxious, nasty, condescending, or untrue lies leave your lips. That is darkness. You are called to be the light. Do the right thing. Help people in need. Say nice things that lift people up and light up their spirits. Be lovely, and pure. Think about excellent things. Think, act, and speak things that are worthy of praise. Imagine that every time you do something that is noble, right, pure, lovely, admirable, excellent, a handful of sparkling glitter falls from the sky and sticks to you, following you around everywhere you go. The more glitter you throw around the brighter your light shines. Now, just because it’s simple doesn’t mean it’s easy. It’s not. You have an adversary working against you. Always coming at you with evil, unkind, nasty thoughts about you, your circumstances, and others around you. These nasty thoughts make you wanna act nasty and then create more nasty-ness around you. You have to throw glitter around from a source that is not your own. This is where you’re gonna need God’s grace. When those nasty thoughts come into your mind, you need to refuel with God. The best way to do this is to repeat the mantra, “I am the light of the world. I am the light of the world.” This is in Matthew 5:14 if you want to look it up. When you anchor back to this manta, it acts as a sword to cut out the evil thoughts and replace it with noble, pure, positive thoughts. This is why not everyone is a star. Because, although it is a simple concept it is not so easy to implement. Still, you are called to do this. And, I sincerely hope you will accept this challenge. I want you to be a pageant star! I want you to be the woman that lights up a room, that everyone is drawn to, and when a judge asks why you, she says, I don’t know, she just had this certain quality about her. I want glitter to stick to your whole entire body and shine light around the entire world! I know God wants this for you too. You have a call on your life to be great and you need to get people to put you up on the table. Let your light shine so the whole world will see. Remember, that song from when you were a kid, This Little Light of Mine? This is a great one to get stuck in your head every morning. Shine your light, my dear. Shine it brightly, all the time, no matter where you are or who you are with, fueled on God’s promises. You are the light of the world. And, that, my dear, is how you win a pageant. An awesome platform is vital to getting appearances, especially before you win a big state or national title. Your platform gets you in the door for appearances and media interviews. And when it comes to pageant week, what you’ve done with your platform is what separates you from all the other contestants. My clients are trained to market what we call a Legacy Project it’s the product or project you lead that uses your unique skills to creatively solve a problem. One of my clients wrote a children’s book that teaches adults how to read to children while entertaining the kids. Another created a DIY home garden project in conjunction with Home Depot. I developed a professional home fitness video series available online for free. Whatever you DO with your platform will be your legacy… you don’t want your legacy to be that you did nothing. 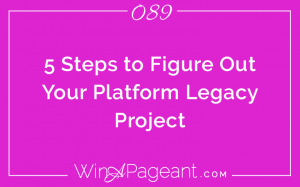 Today, I’m going to give you 5 steps to figure out what your legacy project can be. We’re going to find the intersection between your uniquely amazing qualities and the problems you want to solve. Maybe you are great at cooking or sewing. Maybe you can sing opera better than an opera singer. Maybe you know how to talk a cat out of a tree. Whatever you are excellent at, write it down. For me, I knew I was excellent at speaking on camera, designing home workouts, and marketing things online. If you can sing, but you aren’t the best in your choir, scratch that off. We want to only focus on where you excel above the others. You may end up with about 5 or 8 things on this list. Who is it you are most passionate about impacting? Is it children who have lost a parent? Or abused pets? Maybe it’s adults who want to overcome addiction or teens that are bullies. Write out the characteristics of this person. If you know of an actual person that’s even better. Maybe you’ll say, Heather who is the biggest bully in the 8th grade. Or Sam, your friend’s dad who has struggled with alcoholism for years. Identify exactly who you want to help. For me, I chose to help people who weren’t exercising, but they really wanted to lose weight. of the biggest struggles, challenges, and set-backs that the people you want to help are facing. What is their biggest problem? What are they most afraid of? Maybe the bullies are scared they will not be liked by other kids so they are mean to other kids so those kids won’t be mean to them. Maybe the struggling addict doesn’t know how to break the cycle or where to go for help and feels like if he goes to the AA meetings he’ll embarrass his family. For me, the people I wanted to help were embarrassed to go to the gym and be seen as overweight, so they wanted to work out at home first. They couldn’t afford a personal trainer or they lived too far from a gym to go every day. They also didn’t know how to exercise or which exercises to do in what order. from your second list (step 4) and use your first list (step 1) to create a unique solution to each one of the problems. Get really creative, think outside the box. Don’t be held back by time or money yet. You can flush through the details later. Right now, just let your imagination fly! Some will be better than others, for sure, but this is just meant to help you discover where you can use your unique skills to creatively solve a problem. This is how I decided to create home workouts available for free online. When you’ve struck gold, you’ll know it! Read back through all of your ideas and select any idea that you think is totally magical! That is where the treasure lies! Your legacy project won’t be easy, but it will be life-changing for you and everyone you are able to impact! That, my dear, is how you win a pageant and leave a legacy! Thanks for joining me today and I’ll talk to ya on the next Win A Pageant Wednesday. Hey, girl! Welcome to the Win A Pageant podcast, I’m your coach, Alycia Darby. There are plenty of opportunities for you to answer questions during your pageant interview, on-stage question, introduction, pre-pageant media it can get overwhelming to prepare if you have no specific plan. Most women want to be so perfect, so they craft these elaborate answers to every question under the sun. It seems like a great idea. Especially if they give you the questions in advance like many pageants do. I was working with a client in Pennsylvania who was given all 50 possible questions that could be asked on stage. Before our coaching call, she started writing different answers (all truly wonderful) to each question. It took her forever and when I asked her one of them she would scroll through her long word doc to find her answer and ….. it was awful. Don’t do that. 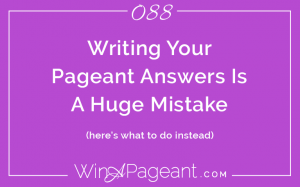 Writing Your pageant answers is a huge mistake! Instead, I’m gonna teach you what I taught her to help you overcome this crazy desire to be overly (and obnoxiously) prepared. Writing out answers to possible questions will inevitably confuse you, force you to stay within a box you created for yourself, hinder your personality, and drive you crazy! Ha! Instead, I want you to plan your answers. 3. What are your platform goals. Of course the questions were all different like “If you win, what will you want to accomplish?” and “If you had $5,000 to spend on your platform, what you would do with it?” One solid answer will fit both of these questions… see what I mean? When you plan your answers, it’s like spilling a box of Legos onto the floor in front of you. If a judge asks you for a blue one, you can quickly grab a blue one. If you don’t have the Legos in front of you when you’re asked for a blue one, you gotta walk to your kid brother’s toy chest, dig out the Legos box and then spill it on the floor. Or worse you gotta drive to Target to buy Legos! That’s how it feels when you get asked a question and you haven’t planned an answer for it. Or you are asked for a blue and you only have red and yellow. This analogy is sorta silly, but I think you get what I mean. You need to plan a story to share for a variety of life categories, not specific answers. A: I would launch another campaign! Last year I launched a kick-starter campaign that raised $25,000 for my platform. I’d plan another launch for 6 months from now and use every appearance and social media opportunity to get people excited about it so when it launches it would quadruple the success! A: I’d hire a kick-starter expert. Last year I launched a kick-starter campaign that raised $25,000 for my platform. I did it all from my own skill set, but with the help of an expert, it’s likely I’d be able to 10x that result! See what’s happening here? I’m using the same planned answer – not memorized or written out – to respond to similar questions. Most women want to say more, but the key here is to only have a few Legos on the floor in front of you and each one of them is excellent. When you plan your answers you prepare enough Legos to respond with excellence and not be overwhelmed. This is a Game Changer! When you unlock this strategy, you unlock a whole lot of space in your brain and you streamline your message to make sense to the judges in a very short amount of time. And that, my dear, is how you win a pageant. I’m honored that you’d join me on the Win A Pageant podcast. If this podcast has been a blessing to you this year, then I’d love for you to share it with someone. This time of year is a great opportunity to catch up on old podcast trainings and if you shared it with someone else they may enjoy listening during holiday travels or while you’re on break from school and work. You can text it or email a link to someone straight from the podcast app, or send them to WinAPageant.com/Podcast. It’d also be a beautiful gift to me! I put a lot of work into bringing you these podcasts each week and it would mean the world to me if you would share it with some of your pageant sisters. God blesses you so you are able to bless others! This holiday season I’m traveling with my husband and our friends to explore Vietnam and Cambodia. I’ll be back on January 9th, so the next podcast will be on Win-A-Pageant Wednesday, January 11th. Have a blessed holiday season and be sure to bless everyone around you! Thank you so much for listening. Talk to you in the new year!